The long-awaited Black RX and the Acrobatter are now available in the Mecha Collection series! The Black RX has been sculpted with precise detail and the iconic head and buckle can be recreated through assembly. Clear parts utilized in the Acrobatter's iconic red eyes have been faithfully recreated. Display with other Mecha Collection Kamen Rider bikes in the same series! 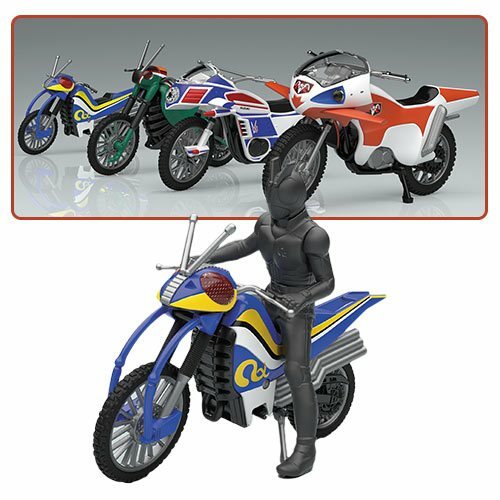 The Kamen Rider Acrobatter Bandai Mecha Collection Model Kit includes Kamen Rider Black RX, 3x Runners, and 1x Water decal sheet. Instruction manual printed on the rear of the box. Measures about 3-inches long.